For two weeks we did not eat at all except for one time at the very beginning of our wanderings. One day we came out to a Savannah area; it looked like something out of Lion King! We were careful, as helicopters were still in the sky and we were obviously being hunted by them. We would stay along the edge of the jungle area until we felt it was safe to actually go out into the long-grassed Savanna. Suddenly one of the brothers caught a baby gazelle that seemed to just stand there, waiting for us. A brother took out a simple razor from his pocket. He pointed the animal towards the Qibla (direction towards Makkah) and we slaughtered it according to the noble shareeah (Islamic Law). This missive became rather popular online, and Maldonado was seen as someone who had been living the dream. Less publicized were his court letters which laid out more bluntly the unpleasantness of his experience, including feeling awkward about being the only white guy in his group and general ineptitude. The court letters didn't get much attention from jihobbyists at the time, but Maldonado is now getting plenty of negative attention from his former friends, thanks to his testimony this week implicating his former friend and fellow Boston-area jihadist Tarek Mehanna. "Make sure when you see [your children after an early release for cooperating] you sit them in your lap and tell them that this time together is thanks to lies and stabbing a Muslim in the back." "I read an interview of Maldonado's earlier and in it he mentions his wife [who died of malaria in Africa] extensively. Perhaps one of the reasons Allah took his wife so early was so she could be spared of what her husband has become." "Didn't Daniel M. know when setting off to a war zone, that he might be imprisoned and not see his children or wife again?! If you can't take the heat, get out of the kitchen, he should have gone to work in a kindergarten instead of somalia. I think the children excuse is just that, an excuse, and the guy just wants to get out even by the cost of our brother Tarek's freedom." "This is much more evil for Muslims than benefit. Think about it, this gives more of a chance for outspoken Muslims to go to jail. This also destroys the fabric of society in the Muslim community because everyone is back stabbing each other so raising your children in this type of environment wont be beneficial. As well this will raise children to think it is okay to back stab Muslims." "Daniel wasn't even tortured, conditions even in supermax are bearable (but may Allah protect all Muslims from such trials), so I find his excuses laughable, if it were not so sad." "we may understand why they betrayed, but that is no excuse for betrayal. i cant see one example where we honor a betrayer because "he chose the lesser of two evils" with this type of thinking, surely the mujahideen and any soldier outfit would fall apart at the seams." There were also those who defended Maldonado, somewhat tepidly, and many who suggested they should not be the judges. Many sharp words, accusations and condemnations were exchanged. In short, it was exactly the kind of thing that ordinary people and counterterrorism officials would like to see on these forums -- fitna, dissent and division. U.S. officials should make cooperators and collaborators more visible. Since 9/11, many a convicted jihadist has fulfilled the conditions of a plea in total secrecy, never emerging to testify in court, sometimes even being released from prison early without anyone ever knowing what sort of cooperation they provided. Disclosing this cooperation has multiple positive effects. First, it creates the divisions seen above. Secondly, it discredits jihadist narratives. Maldonado's letter to the forums about his adventures in Somalia will not be so warmly received in the future. It reinforces an existing meme among would-be jihadists that you can't trust anyone, no matter how credible they look. And finally, it hedges against convicted terrorists who play a double game of cooperating and then recanting, whether in letters from prison or after their release. If Maldonado succeeds in getting an early release thanks to his testimony against Mehanna, he won't receive a warm reception among his radical former friends. Huffington Post: Is AQ's Inspire Uninspired? Fox News: J.M. 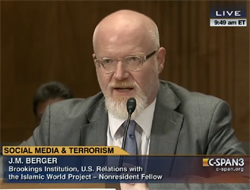 Berger seen in "Secrets of 9/11"